It’s a well-known fact that we’re surrounded by huge amounts of data. Even if you manage one single Linux server, you will probably still encounter problems when trying to manage all of your logs because they are intended to detect and act on issues as soon as they happen. The significance of this issue varies based on the size of one’s environment, the role of each host, the services that are installed, and the protocols that are used. Of course, log data can give us better insights into detecting patterns and allow us to take action more quickly when that information is presented in visualized form. This method of analysis allows IT operations teams to create the transparency that is needed to understand what is occurring at any given point in time. Kibana and Grafana are two open source tools that can visualize and understand trends within vast amounts of log data. In this post, I will give you a short introduction to each of the tools and highlight the key differences between them. Kibana is a platform for analytics and visualization that allows you to explore, visualize, and build dashboards on top of the log data stored in Elasticsearch clusters. You can perform advanced data analysis and visualize your data in a variety of types of charts, tables, and maps. Many modern IT organizations such as Netflix and Linkedin use the the popular ELK Stack (Elasticsearch, Logstash and Kibana) for log management. Using Kibana within this stack makes it simple to deploy and use visualizations. Once the ELK stack is installed, you will be able to access Kibana’s powerful tools within the “Discover” section of the platform to explore and visualize your log data. Kibana’s simple and easy-to-use dashboard can be used by anyone, even business users with minimal IT skills and knowledge. Grafana is is an open source dashboard tool that commonly works with Graphite, InfluxDB, and OpenTSDB. Newer versions can also work with other data sources such as Elasticsearch. The main difference is that Grafana focuses on presenting time-series charts based on specific metrics such as CPU and I/O utilization. Kibana, on the other hand, runs on top of Elasticsearch and can create a comprehensive log analytics dashboard. For example, Grafana does not allow for data search and exploring. By default, the Kibana dashboard is public. There are no built-in role-based access (RBA) controls. If you need to set up permission levels for multiple users, you will have to purchase Shield to add the additional configuration overhead. In comparison, Grafana’s built-in RBA allows you to maintain user and team access to dashboards. In addition, Grafana’s rich API can be used for tasks such as saving a specific dashboard, creating users, and updating data sources. You can also create specific API keys and assign them to specific roles. While Kibana has a large number of built-in types of charts, the control over them was initially limited. 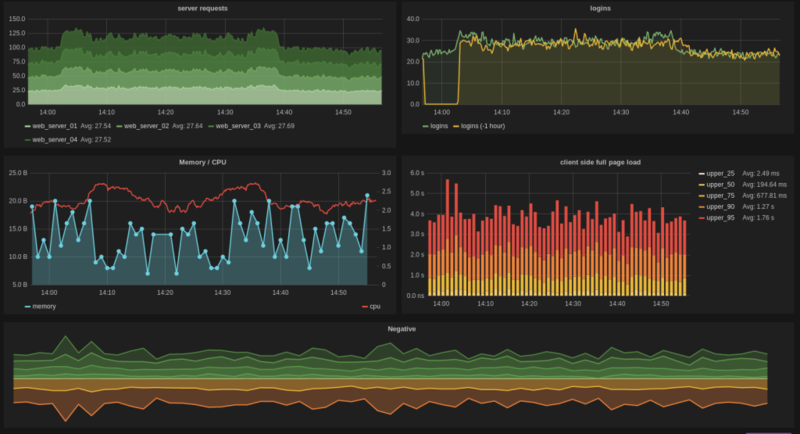 Initially, Grafana contained several more options for flexible navigation and chart usage using tools such as the Y-Bar when choosing a specific time series. However, with the enhancements presented in Kibana 4 such as the ability to save elements and drag-and-drop them into new dashboards, we can expect Kibana to close the gap quickly. Grafana supports many different storage backends. For each data source, Grafana has a specific query editor that is customized for the features and capabilities that are included in that data source. However, as mentioned above, Kibana’s native integration within the ELK Stack makes the setup fairly simple and user-friendly. 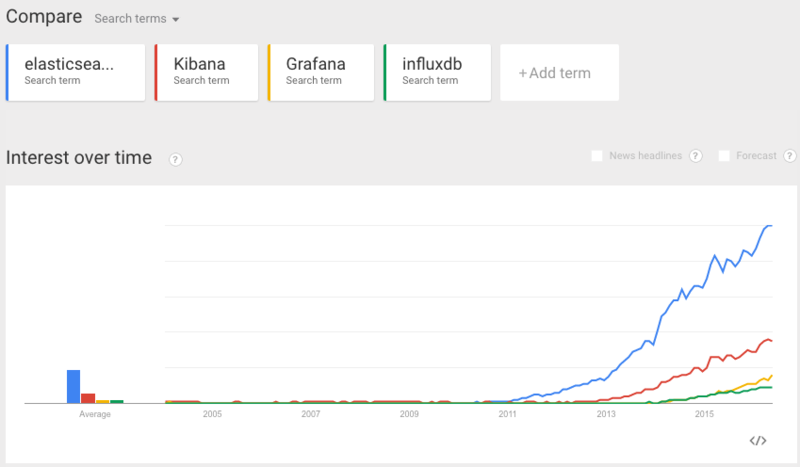 Both Kibana and Grafana are powerful visualization tools. 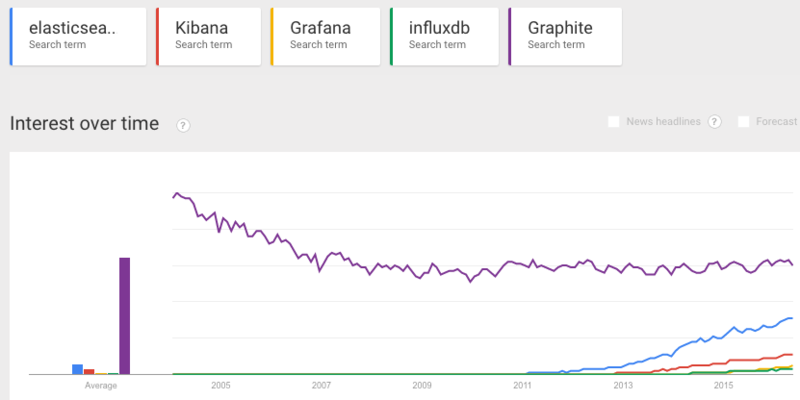 However, the Grafana and InfluxDB combination is used for metric data whereas Kibana is part of the popular ELK Stack, which provides more flexibility when exploring log data. Both platforms are good options and can even sometimes complement each other. First, use Kibana to analyze your logs. Then, export the data into Grafana as the visualization layer. Both rely on the same Elasticsearch repository.